TIME MODEL INTERNATIONAL: Milan Fashion Week AW/15 - Beatriz Grander for Roccobarroco - opened and closed. 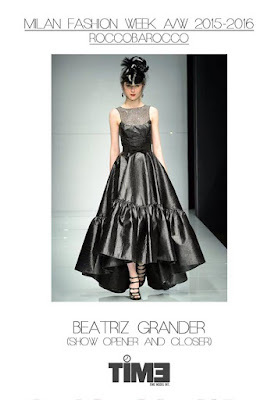 Milan Fashion Week AW/15 - Beatriz Grander for Roccobarroco - opened and closed. Editorial - Thiago Ruman for Tao Magazine. Editorial - Beatriz Grander on ELLE Italia. Editorial - Jhenyfy Muller for A&E. Editorial - Giovanni Tosi for Garage Magazine. Michelle Xavier in New York!